As the 20th century approaches its end, people all over the world are anxious that the world is changing. And probably not for the better. Kenji Endo is a normal convenience store manager who's just trying to get by. But when he learns that one of his old friends going by the name "Donkey" has suddenly committed suicide, and that a new cult led by a figure known as "Friend" is becoming more notorious, Kenji starts to feel that something isn't right. With a few key clues left behind by his deceased friend, Kenji realizes that this cult is much more than he ever thought it would be—not only is this mysterious organization directly targeting him and his childhood friends, but the whole world also faces a grave danger that only the friends have the key to stop. Kenji's simple life of barely making ends meet is flipped upside down when he reunites with his childhood friends, and together they must figure out the truth of how their past is connected to the cult, as the turn of the century could mean the possible end of the world. 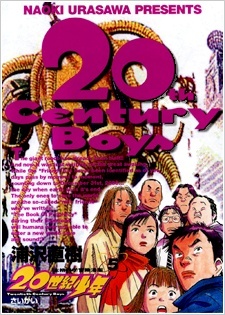 20th Century Boys won the Kodansha Manga Award in the general category in 2001, an Excellence Prize at the Japan Media Arts Festival in 2002, and the Shogakukan Manga Award in the general category in 2003. The series' combined storyline won the Grand Prize at the 37th Japan Cartoonist Awards on May 9, 2008. VIZ Media published the series in English under the VIZ Signature imprint from February 17, 2009 to September 18, 2012. VIZ Media licensed the series in 2005; however, at Urasawa's request, it was rescheduled for release after Monster finished its English publication due to a change in art style over time. The series has also been published in Brazilian Portuguese by Panini Comics/Planet Manga since September 2012. The series was adapted into a trilogy of live-action films which released in Japan between August 30, 2008 and August 29, 2009. 20th Century Boys is about a group of men (and one woman) who, when they had been children, had been best friends, sharing a &quot;secret base&quot; in an overgrown field: a sanctuary where they could read manga, listen to music, and hide from the most evil twins in history, Yanbo and Mabo. One day, their &quot;creative genius,&quot; Kenji suggested they bury a time capsule, fill it with their treasured possessions, and agree to unearth it only when the earth was in grave danger, for they would then save it. Years later, they find themselves leading ordinary, unglamorous lives, their dreams of greatness long-buried under the dust of adult pragmatism. But then strange deaths caused by a mysterious virus begin occurring, and murders and disappearances occur one after another. Then one of their number becomes one of the dead, and all the clues point Kenji to a mysterious man who calls himself &quot;Tomodachi (Friend),&quot; who uses as his sign a symbol known only to Kenji's circle of friends. As the scale of damage and the number of deaths rapidly increase, Kenji realizes that all the terrors are occurring as he had once set down on paper, in a story he and his friends had written, and buried in the time capsule they had sworn over. 20th Century Boys is difficult for me to summarize without giving too much away, but even if I were to divulge half of its secrets, we would still not be anywhere near solving the mystery of &quot;Friend&quot; and of his motives. At first glance, 20thCB seems to be a crude shounen manga that would probably not appeal to everyone, judging by the artwork alone. But it is not. True, there are no pretty boys or girls to easily fangirl (or boy) over in this series, but this kind of story does not need exaggerated, surreal beauty in its artwork to survive. This truly is a graphic novel, where the plot moves with speed, certainty, and intelligence rather than rely on hundreds of feathers and cherry blossoms to depict angst and drama. The art is actually pretty polished as well, the inking clean and deliberate, and the panels arranged simply but effectively. Like movies these days, many manga artists tend to rely on &quot;special effects&quot; or glamorous art rather than plot to attract readers, but 20thCB has enough plot that any eye candy would just be a bonus. Character development in 20thCB is also something I liked. Kenji grows and changes as the series progresses, and so do the other characters. The dynamics between the friends are believable, and their heroism so simple and understated. I can't really find much to say about this manga, simply because it's so good and interesting and I probably wouldn't be able to do it much justice. But if you're looking for a fast-paced intelligent plot, masterfully created characters, and a mystery that can have you at the edge of your seat, then give this series a chance. While the whole "saving the world" kind of storyline isn't anything new, it does it so well that it makes the reader so engrossed in the story and not want to stop reading. The switch between timelines are done so well that it hardly leaves you confused on what is going on. There are so many twist and turns in the story which makes nearly every chapter such an enjoyable read. The art is quite detailed and even as the art was already quite good from the start, as it goes on it steadily improves. I have to say Urusawa's distinct art style definitely is growing on me as it's such a refreshing treat compared to the sea of "Moe" that is pretty common in anime and manga. My favourite aspect of 20th Century Boys has to be the cast of characters and their development through out the story. All of them have interesting traits and everyone was given a time to shine. There isn't much cliched character archetypes here, most of the characters act mostly realistically so no annoying tsunderes etc. One example would be Yoshitsune as at the beginning he would seem like one of those stereotypical anime characters with glasses which are usually really weak and cowardly but it turns out he was the one that really stood up for his friends and always tried to do everything to help them. The main character, Kenji seemed like the most "normal" out of all the characters, while some people would find him boring and they'd probably like Otcho (Kenji's best friend) more but honestly there isn't anyone more suited that him to be the main character since he's the most normal and easiest to relate to. I saw 20th Century Boys ranked quite highly here in MAL and I'm glad I gave it a chance. It's truly a masterpiece in my eyes. It's highly recommendable and I can't even say it enough you HAVE to check this manga out. After finishing it I literally just took my time thinking about what an amazing manga I just read. Also how can you not want to read a manga that has a villian called Friend and a homeless guy called God. 20th Century Boys is a Seinen, Sci-fi, Psychological manga that takes storytelling to a whole new level. From the beginning of the manga it is already clear what already happened and so the story just basically reveals, bit by bit, explaining the events that took place. However you have to be prepared for some major plot twists. What is so interesting about the story, is that it is set in different timelines (Childhood Era, Adult Era and Friend Era), which gives more insight into the characters and events that took place. However it is very hard to follow these different timelines, because it feels like reading a story within a story. Yet after a while it is easy to get used to it and there are plenty of plot twist and unexpected surprises a long the way. The characters of 20th Century Boys are an essential part of the story, because it is basically about ordinary people doing extraordinary things. Even though the characters may not be well defined, in the beginning, they are incredibly well developed. The only problem is that there are a lot of characters to remember and a lot of different timelines to keep track of them in. The artwork is pretty amazing as it has the same sketchy style as Urasawa’s other works. The environments have a lot of detail put into them and the only problem I just that the character designs can be too sketchy. This means that subtle changes in facial expressions can be unnoticed; on the other hand the characters have well defined facial features that allows you to tell them apart, once you get used to it. Overall 20th Century Boys is a manga that brings a whole new meaning to regular people trying to save the world, from evil villains? As I started this manga I had no idea what to expect and I didn’t know why it was so popular, but I’m glad I found out. However from reading this manga I have learned the terrible truth; Good will not always prevail over Evil. That’s what made this manga so frustrating to read, at times, but very addicting at the same time. So if you’re a manga fan, then 20th Century Boys is a must read. The best manga I've read, I really can't describe the legendary of this manga by words..
Naoki's art style is not shounen style, his art is distinct, not like the author, he made a new art style, Personally i prefer his art than the other. "MOE" fans never would like it, so "MOE" fans don't read it. It's such a legend, Really, as long as you read it you will know what i mean. It's also ranked as sixth, I haven't seen someone read it and dislike it, just give it a chance and read it, I'm sure you'll like it!